A number of bus routes were cancelled on Friday, and the list of cancellations provided by the Ministry included seven buses serving CedarBridge, and one each for Heron Bay, Tatem and Berkeley. Minister Fahy said, “It is obviously distressing for the public and even more so for students preparing for examinations when their bus service is delayed or cancelled. “I have spoken with the Minister of Education and assured him that the Department of Public Transportation [DPT] is doing everything possible to reduce such occurrences. 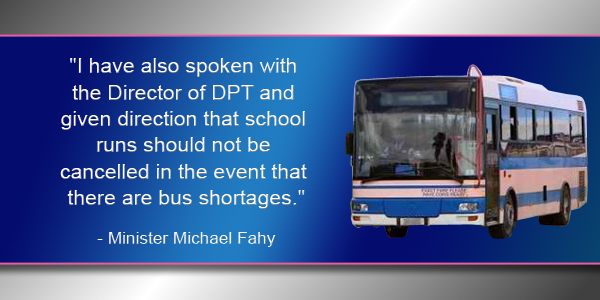 “I have also spoken with the Director of DPT and given direction that school runs should not be cancelled in the event that there are bus shortages. I have been given assurances that this direction will be adhered to. “I can reiterate the Director’s comments last week that CedarBridge Academy is not targeted. DPT and I are keen to ensure our school students, whether they are in public or private school, are given safe and reliable public transport so that they can get to school on time and not be worried about whether they will miss exams due to poor bus service. I can assure parents that this is a top priority for me and DPT. The Ministerial directive is good. There will be inconvenience to the general public but schools must have priority. This is obviously a difficult challenge but to hear all busses to Cedarbridge and Berkeley cancelled first thing in the morning definitely sends the wrong message to students. Whilst grateful that the routes were eventually covered, the damage was already done since people had to scramble to make changes to their normal routine. Lastly.. the obvious question – where is our priority. There is lots of other spending going on… which indicates that money is not the problem but our priorites!! Always after the fact Fahy. As an OBA supporter you can take it from me that you have no clue what the hell you do most time/s. Your nothing but a ‘Janitor’. Because, of course, he knew about it before the fact, right? I’m sure the DPT keep the ministry fully briefed at all times. Last week, the school was told it’s a scheduling issue, now it’s old buses. I don’t think the Minister does the schedule or the driving but does have to step in when common sense is needed . Minister Faye, Why are you just noticing that school routes have been cancelled? Cancellations have been on going and surely you and or your PS get a list of bus cancellations? Sometimes you try too hard to sound smart. Just apologize for overlooking the issue and fix it. When are the new buses arriving? If the government maintained the buses on a regular basis, we would not be in this predicament!. Minister Fahy, can you please explain to the public why it is that the one service that so many of us rely on daily basis, has been so badly neglected? Something like this does not happen overnight. Not only is our airport in a dustingly deplorable state, but we cannot even provide a decent public transportation system. The last time I caught the bus, the stop bell wasn’t working and people had to yell out to the bus driver for their stop! How is it that Bermuda is one of the wealthiest countries per capita in the world, but we are unable to maintain our public transportation system? Definitely an election in the air. This ‘directive’ hasn’t been issued during the last 4 years whenever buses were cancelled to and from the schools. yes and this directive wasn’t issued in the preceeding 14 years before that! but NOW we have it! Thank you OBA. and yet STILL no indication at all how on earth we are going to manage with public transport during America’s Cup! Wait till the island is full to bursting with tourists and visitors cruise ship passengers and visiting crews of yachts etc etc – we cant cope now – how can we cope then?? ?